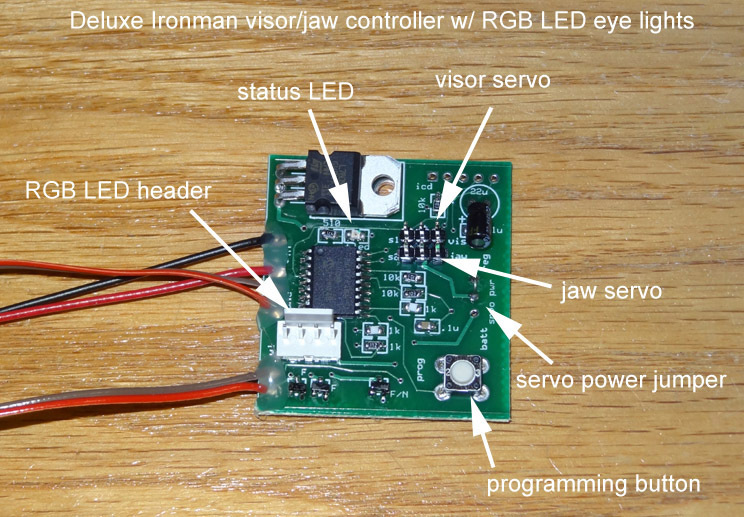 The servo board will allow you to motorize the face and jaw of your ironman mask. It will also control the red/green/blue (RGB) light array for the eyes. The servo controller board comes standard with a pushbutton to command the servo motors: Press it once and the jaw will open first, followed by the visor. The eye lights will automatically go out.. Press it again and the visor will close first, followed by the jaw. The eyes will go on. The delay between the jaw and visor activation is also programmable between 20ms - 1 sec. The light driver circuit can handle up to 600mA of current or 1.5A with a simple upgrade. This deluxe version also includes the 2 RGB light strips that are controlled via the board. The eye lights automatically come on when the visor is down, and turn off when the visor opens. You can also change the color of the lights to one of many different colors (red, white, blue, purple, green, etc). This allows you to change the color of the eye lights on the fly if you want! Click HERE to see a movie of the RGB eye lights in action (servos were not connected in this movie)! Small size: 1" x 1"